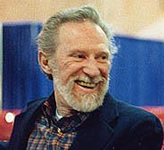 John Morressy was a science fiction and fantasy writer and a professor of English at Franklin Pierce College. Morressy published more than 25 novels and short story collections, as well as poetry and nonfiction. Here’s John Morressy’s obituary. The Kedrigern Chronicles — (1986-1990) Publisher: A wizard’s life is not an easy life. One never knows who, or what, one’s next client will be, or what kind of unpleasantness he, or she, or it, is bringing. And there’s always the certainty of travel to far places over bad roads in nasty weather. It’s no wonder wizards prefer to live solitary lives in isolated towers or ruins or caves. They’re looking for some peace and quiet. But it makes for a lonely life. So when a young man of 160 or so-no age at all for a wizard-meets a beautiful enchanted princess and releases her from a cruel spell, it seems the perfect chance to settle down to a life of cozy domesticity. With a bit of magic here and there to take care of the housework and a loyal house-troll to do the heavy lifting, things ought to be idyllic. And they would be, if it weren’t for the unreasonable clients, the barbarian swordsmen, the home furnishings with minds of their own, the otherworldly intruders, and the rest of those annoying day-to-day problems of the profession. 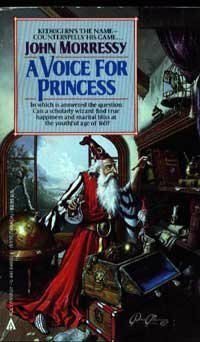 A Voice for Princess is the first volume of John Morressy’s Kedrigern Chronicles, a series of novels and short stories about the reclusive wizard Kedrigern. In this first novel, Kedrigern retires from the wizard guild because he’s mad at his colleagues for schmoozing with alchemists (whom Kedrigern considers beneath barbarians on the human worth scale). Accompanied by his ugly but loyal house troll, Spot (whose vocabulary consists entirely of the word “Yah!”), off Kedrigern goes to build himself a solitary home on Silent Thunder Mountain. Iron Angel — (1980-1985) Publisher: Upon their father’s death the three sons of Vannen were stunned to learn of their legacy: swords of gold, silver, and iron — and a lost kingdom. It seemed like a fairy tale, until they were attacked by a hideous creature that fought on even after it was beheaded. It was then that the brothers learned their lands were held by the Cairnlord, a powerful wizard steeped in evil. He was centuries old, perhaps not even human, and he had no intention of giving up the throne. Del Whitby— (1972-1983) Publisher: For sixteen years, Del Whitby lived quietly among the pious farmers of the planet Gilead, in a society bypassed by 27th century progress. Then, on the eve of his sixteenth birthday, he was kidnapped by a band of Daltrescan slave traders, and sold to a gladiatorial school on Tarquin VII. After a series of excruciatingly close encounters, Del proves his prowess in the arena, and is awarded his freedom, and a spaceship. He now begins the perilous voyage home to distant Gilead, a trek which will take him to the outermost reaches of the galaxies and back. The Humans of Ziax II & The Drought on Ziax II — (1974-1978) Ages 9-12. This double-books contains two novels about Ziax: The Humans of Ziax II and The Drought on Ziax II. Publisher: A young Earth Pioneer finds himself a prisoner on Planet Ziax II. The Windows of Forever — (1975) Ages 9-12. Publisher: Shortly after moving into the home of an uncle who disappeared, Tommy falls through an opening into both a past and future time.